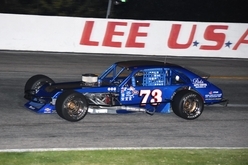 On September 1st Senior Tour Auto Racers made their 2nd appearance for the 2017 season at the Lee USA Speedway in Lee, NH. It was “Back to School Night and Rides for Kids Night”! 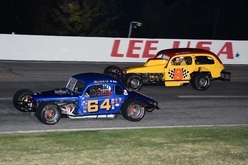 Star rolled into Lee USA Speedway with 21 of the most beautiful vintage race cars that came together to show the fans what racing was like back in the 60’s and 70’s and STAR certainty had a huge selection of cars ranging from coupe, sedans, Vega, Pintos and more. 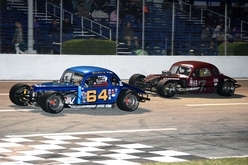 Cars came from all over the New England states and Canada. 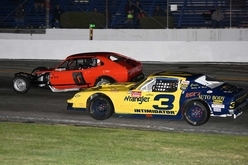 To start STAR’s day, both the Sportsmen and Modifieds had 2 rounds of practice and their evening would bring the tour 2 heats and 2 features. 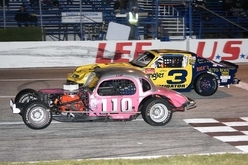 The first to hit the track was the Sportsmen for their heat race. 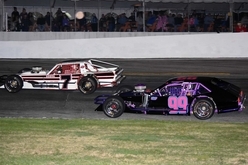 It was Richard Eastman from Ma in his #0 Pinto and Frank Foley from Ma in his #3 Camero who dominated the field, side by side until the first checkered came down on Eastman to take the win. 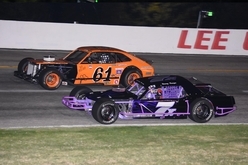 Foley came in with a very close second and Robert Harless from NY in his #8 sedan rounded the pack off with a third. 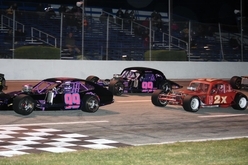 The Modifieds were staged ready to hit the track for their heat race. 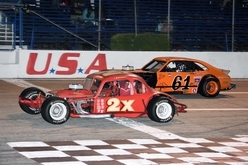 The second checkered was dropped down on Bobby Turner from Me in his #7 Omni. 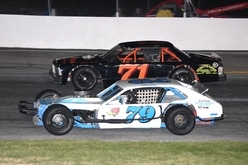 Right behind Turner was Scott Poirier from Ct in his #73 Pinto and Charlie Lima from Ma in his 2X coupe. But it would be Poirier to pick up the second place with Lima to take down a close third. 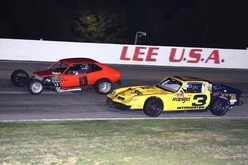 Between the heats and feature races, Lee held its annual “Rides for Kids”! This is always a big hit with the children. 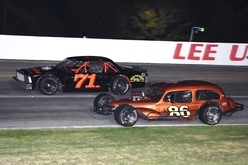 STAR would like to thank the members and drivers who participated in this. The children got a big kick out of this and some point I saw adults getting into the cars to get a ride. Thank you to all! 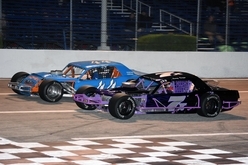 Then it was off to feature time. 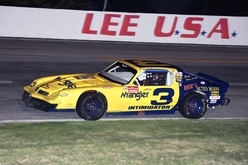 The first division of STAR to roll out was the Sportsmen. The green came down and it was off to racing. 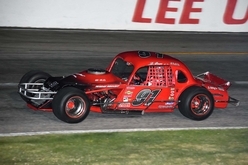 Robert Harless from NY in his #8 sedan would take the last checkered for the Sportsmen that night. 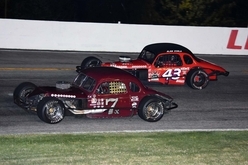 Arthur Merchant from Ma in his #64 coupe would pull off a second and Alan Zemla from Me in his #43 coupe topped off the pack with a third. 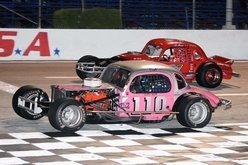 All three were brought trackside for an out of car interview and presented with trophies. 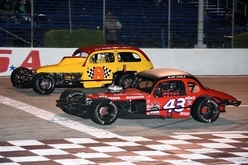 The modified were staged and ready to ground pound some more vintage racing. 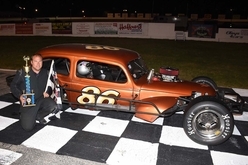 Ryan Chadwick from Me in the #86 sedan captured the last checkered flag for the evening. 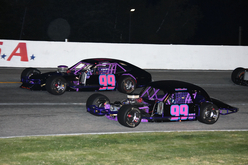 Bob Donahue from NH in his #99NH coupe took a second and to round out the pack with a third was Jocelyn Laliberte from Quebec Canada in his #61QC Pinto. 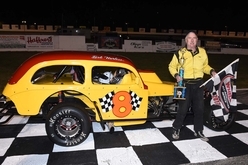 All three were brought trackside for an out of car interview and presented with trophies. 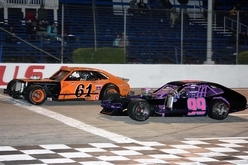 WHOW what a night of racing! 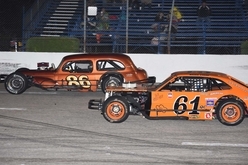 Thank you to all the drivers who came tonight to make the show a huge hit! 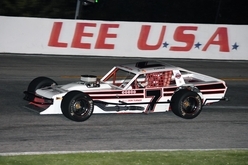 STAR would like to thank Lee USA Speedway and their entire staff for all their hospitality and a great night of racing!